I named my business Portage because I love backcountry canoeing and fishing. And my favorite part of these backcountry activities is portaging from one lake to another, either to continue my canoeing route or to find the next great fishing lake. Portage means carrying a canoe or boat over land to avoid a water obstacle like rapids or a waterfall or to get from one navigable water body to another. I found the definition a wonderful metaphor for what I do as a coach. As a coach, I help folks navigate their personal transitions, from where they are at the moment to where they want to be and, at the same time, discover and deal with the obstacles they need to go around. 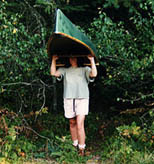 Portaging generally requires unloading the boat or canoe and carrying it and its contents over the portage trail. If it's a portage that many have taken before you, the path can be quite clear of obstacles and easy to navigate. On other portages a trail must be blazed and the terrain can be very difficult. As a coach, I do the same, helping my clients decide what they want to take with them on their next transition and what no longer serves them and is best left behind. I help you find the path that others may have taken before. And if there is no similar path, I help you blaze a new trail. To portage efficiently, a tump line on your pack, which goes around your forehead, and a yoke or tump line on your canoe are valued tools. The tump line sounds awkward but with the bearing of your load beginning at your forehead, it helps distribute that weight evenly and efficiently down your spine. It's incredibly more efficient than having your load begin at your shoulders. This is the way the early voyageurs and natives managed their portages. I guess I could have named my business Tump Line or Yoke as a metaphor for those things that make the Portage easier, but they're not very pretty words. You'd all be laughing and the “yoke” would be on me. But as a coach, I do have a wealth of "tools" to help you transition with the least amount of discomfort. Portages can be very short as in a few rods or meters to many miles or kilometers in length. And all portages, by their nature, are the result of elevation changes. Either the destination lake is higher or lower than the one you are leaving, or the land between two bodies of water rises and falls, or, as in the case of a river, the elevation of the river changes dramatically creating swift rapids or a waterfall that must be safely portaged around. This results in all portages involving some climbing and/or descending. third stage, Exploration, we begin to feel like we have some direction. We're beginning to crest the peak of the portage trail and we can often look ahead instead of constantly down at our feet in order to avoid pitfalls. We find new reserves of energy and become optimistic, confident and even eager. This is the stage where our vision for the future begins to emerge, much like reaching the peak of the portage trail. And the final and fourth stage is Renaissance. We become committed and creative as everything begins to feel possible. We move at a faster pace. On the portage trail, this is the wonderful downhill stage where the new vista is clearly in front of you and your load is lighter as you shift from trudging uphill to flowing downhill. The thing to remember about portages, as in transitions, is that Renaissance feels like it will last forever. But sooner or later we become restless. Then we find ourselves looking for the next portage and the newness it holds at the other end. Thanks for listening and humoring me this month. See you on the Portage.